The pictured fisheries and fishing boats are located on the west side of the Karaburun Peninsula, south of Kucukbahce Village. 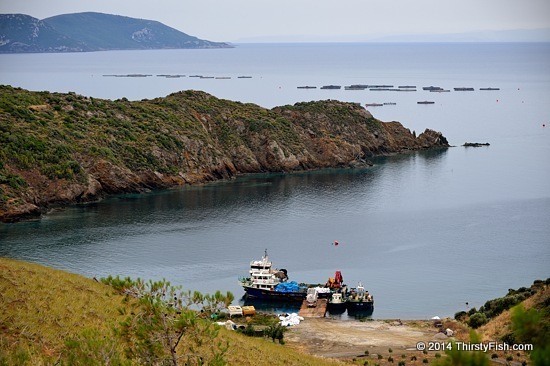 Local environmentalists are challenging fish farms in the Karaburun area due to their impact on the habitat, but, as usual, are overwhelmed by corporate interests. World's oceans are running out of fish, but no one seems to care. The island to the right of the frame is the Greek Island of Oinousses, and the island noticeable in the far central horizon is Chios.